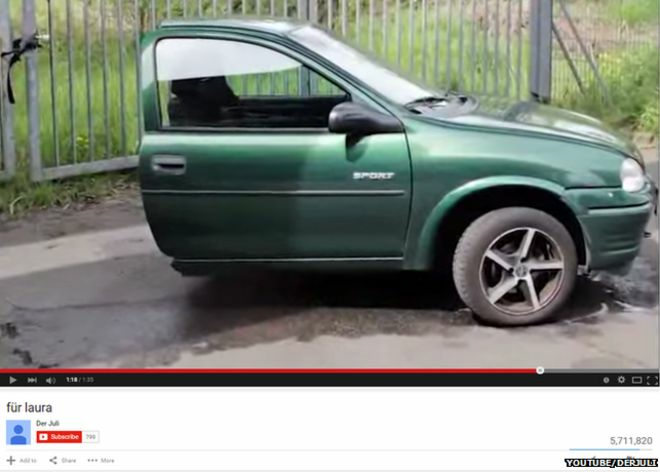 A spurned boyfriend wreaked revenge on his ex after they split up - by cutting everything they owned together in half. Clearly bitter at the break-up, the German man, who identified himself only as 'der.juli' took his power tools to everything, from the TV, a laptop, an iPhone5, a car, the sofa and the beds, as he took the 'split' literally. He didn't even spare a teddy bear. The man also posted a YouTube video which showed him sawing the items in two with the caption: " 'For Laura' -: 'Thank you for 12 'beautiful' years Laura !!!!! you've really earned half." In the video he is seen carefully splitting each of the items with meticulous precision. The clip finishes with him signing-off with the message: "Greetings to my successor". It must have been a really bad break-up, if the pictures of the aftermath are anything to go by. Evidently, it was his idea of payback, after she broke his heart in two. The husband cut the house in two. A couple who separated after 40 years of marriage split their house in two -- literally. "It is the strangest thing I've ever seen," said May Titthara, who wrote about the case for The Phnom Penh Post, an English-language newspaper in the Cambodian capital. "People there never saw this happen in a divorce. It is very interesting for them." The husband and wife had been living together in the house in a village in the Prey Veng province of southern Cambodia, roughly 50 miles (80 km) from the capital. The couple would not talk to the newspaper, but the village chief told May Titthara that the husband was angry because his wife wouldn't tend to him when he was ill.
Last week, the husband and his friends moved his belongings to one side of the house -- and sawed and chiseled it off, said the reporter, who interviewed the village chief and neighbors. The couple also divided their property into four sections: for themselves and their two children. Because the couple side-stepped the provincial courts when they parted ways, their unusual resolution could pose a problem later, said Prak Phin, a lawyer for Legal Support for Child and Women in the province. "This was a not a legal divorce. It never went to the court," he said. "If they have disagreements in the future, they will not have a legal (recourse)." 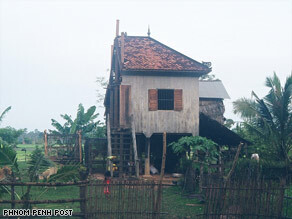 The man moved his part of the house to his parents' property, May Titthara said. He lives with his parents, while the wife continues to reside in her precariously perched, upright half. The halves â€œDer Juliâ€ considers rightfully his are currently for sale on eBay. A total of 16 items are offered. 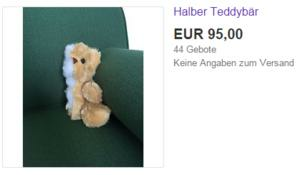 Buyers in need of half a teddy bear, half a bicycle or half a vinyl record of R.E.M. album â€œAutomatic for the Peopleâ€ should keep in mind that shipping is only available in Germany. 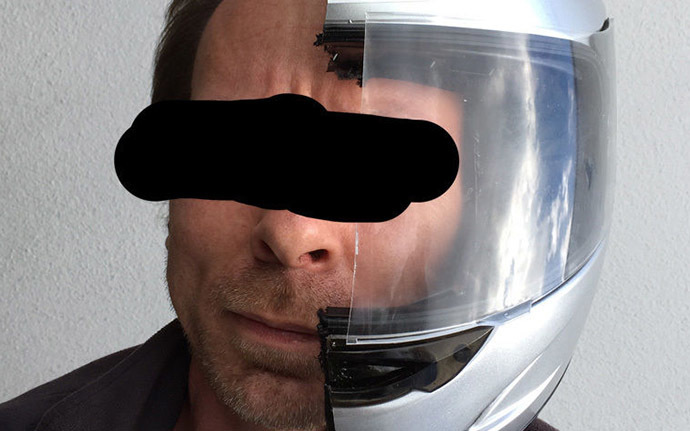 One of the items is half a motorcycle helmet, which, â€œDer Juliâ€ says, offers good visibility on the right side. The semi-protective gear is on the head of a tanned man, who appears to be in his 40s, his eyes painted over to make recognition difficult. 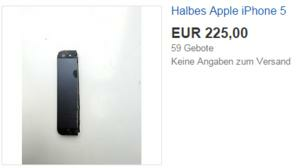 Presumably, itâ€™s the eponymous seller himself. Itâ€™s not clear whether the divorce story is true or just a hoax. The video has scored over 3.3 million views since its publication on Tuesday, so one way or another, â€œDer Juliâ€ seems to have made his point. Splitting everything literally in half is not as uncommon in divorces as you might think. In 2008, a 76-year-old Serbian farmer, married for 45 years, used a grinding machine to cut in half his farm tools and machines to comply with a court ruling to share the household goods with his ex. He was still thinking about how to split the cow, reports said. A Serb farmer used a grinding machine to cut in half his farm tools and machines to comply with a court ruling that he must share all his property with his ex-wife, local media reported on Thursday. Branko Zivkov, 76, told Belgrade daily Kurir he had been ready to give his wife Vukadinka her equal share of everything earned during their 45-year marriage, but was furious at being asked to give away half his farming equipment. Instead, he bought a grinder and cut in two all his tools, including large items such as cattle scales, a harrow and a sowing machine. "I still haven't decided how to split the cow," he told the newspaper. "She should just say what she wants -- the part with the horns or the part with the tail." Screenshot of YouTube video of a man sawing possessions in half. What seemed to be an extreme act of revenge by a husband against a cheating spouse turned out to be a marketing campaign by a German legal information company. It was a parting statement - literally. 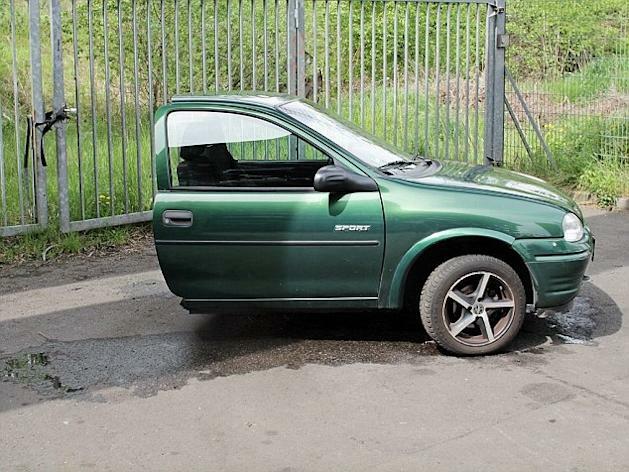 A newly-divorced German man, "Martin", recorded himself sawing all his possessions in half, and then put them up for sale on eBay. But as it turns out, that was not the half of it (er, pun intended). In fact the whole stunt was the creation of Deutsche Anwaltauskunft, an information portal for the German Bar Association. The lawyers' group confessed on their website, saying both the husband and his story were fakes. "The idea behind it was to humorously point to a problem that is not only relevant in Germany: Too few married couples take precautions for the case of a possible separation - for example with a marriage contract. The event of divorce then often ends in bitter fights under which not only cars and furniture suffer but especially the affected couples and their children." Apologizing to everyone who was "teased" in the name of highlighting divorce law, the association added: "Hopefully, at least, you felt well entertained." The items on eBay do exist, though, and will be auctioned off, with proceeds donated to charity. Somehow it was ,er, too good to be true. The worse half of it, though, was the bar association's hand.